The Camantigue plant and flowers. CAMANTIGUE. Noun, Indigenous Filipino origin, Toponym, Original Argawanon Surname. Is a species of Impatiens native to southern Asia in India and Myanmar. In the Philippines it is called kamantigue or camantigue. 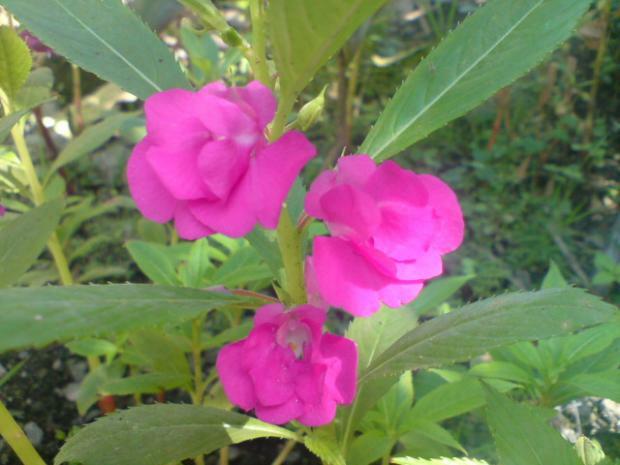 It has the scientific name Impatiens balsamina (Garden Balsam or Rose Balsam). The CAMANTIGUE family name of Argao, Cebu was one of the 700 plus family names adopted in the town in accordance with the Claveria decree of 1849. It's earliest traceable ancestor was Francisco Agustin (Camantigue) and his wife Maria Rustica, who were both born in the middle of the 1700s. It was their son Juan Marcelo Camantigue who chose the last name for his family. This family name is one of the few names adopted in 1849 that has become extinct today (in the town of Argao, at least). The last time the Camantigue family name appeared in records was in the 1870s. Though there are thousands of people in Argao who are descended from the family, none carry the family name today. (1) Nicolas Antonio married to Francisca Ana. Their two children did not carry the Camantigue last name. Their son, Juan Nicolas, carried LUNA, while their daughter, Rosa, carried SARONA. Through Juan Nicolas (Luna) and his wife Maria Juana (Gonzaga), the descendants are Lunas. Rosa married Mateo Baoy, thus her descendants carry the Baoy last name. (2) Juan Marcelo Camantigue, who adopted the last name in 1849/50, married Maria Gregoria Gonzaga, the first cousin of Maria Juana, who married Juan Nicolas Luna. Juan Marcelo Camantigue had two daughters, though only one, Basilia Petrona Camantigue, married and had children. A. Salvador Bernardo Birondo - descendants carry the last name Birondo. B. Martin Bernardo Birondo - descendants carry the last name Birondo. C. Gregorio Birondo - descendants carry the last name Birondo. D. Maria Candelaria Birondo m. Feliz Sanchez - descendants are Durans and Panerios. E. Lino Bernardo Birondo - descendants carry the last name Lucero. F. Eustaquio Birondo - - descendants carry the last name Birondo. G. Tomas Birondo - descendants carry the last name Birondo. H. Fausta Birondo m. Faustino Labrador - descendants carry the last name Labrador. I. Ysidora Birondo m. Gregorio Sanchez - descendants carry the last name Sanchez. J. Agapito Birondo - descendants carry the last name Birondo. K. Florentino Birondo - no issue. L. Vicente Birondo - descendants carry the last name Birondo. M. Apolinario Birondo - descendants carry the last name Birondo. To trace your own CAMANTIGUE family tree, contact the genealogist.